Satellite - object that revolves around a planet You will be surprised to find out just how many satellites are out in space and what they do. If you are curious, you have come to the right place! 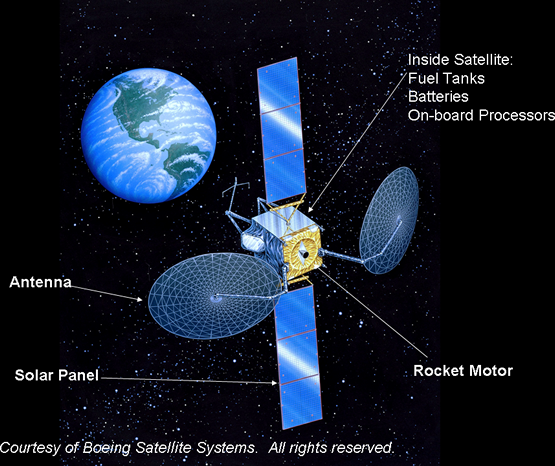 A satellite is basically any object that revolves around a planet in a circular or elliptical path (orbit). The moon is Earth&apos;s original, natural satellite, and there are many man&dash;made (artificial) satellites, usually closer to Earth. Thousands of artificial satellites orbit Earth. Although anything that is in orbit around Earth is technically a satellite, the term “satellite” is typically used to describe a useful object placed in orbit purposely to perform some specific mission or task. It takes a lot of energy to put a satellite in orbit. Most satellites are launched into space on rockets. A satellite orbits Earth when its speed is balanced by the pull of Earth's gravity. Without this balance, the satellite would fly in a straight line off into space or fall back to Earth. They need to reach at least 120 miles (200 km) above the earth at a speed of over 17,000 mph to get in to orbit. A satellite at 17,000 mph speed with its forward momentum will balance gravity, and it will circle the Earth. On the other hand, if the satellite is launched faster than 23,500 mph, it will leave the gravitational pull of the Earth. Space Shuttle carrying Satellite The space shuttle was NASA’s space transportation system. It carried astronauts and cargo to and from Earth orbit. Multistage rockets are used to launch satellites. The first stage of a multistage rocket contains engines that provide a huge amount of force. This stage lifts the entire launch vehicle–the satellite, the rocket body, and its fuel–into Earth&apos;s atmosphere. After the engines run out of fuel, the first stage separates from the rest of the rocket. Then the second stage starts. It provides the energy to lift the satellite in its orbit. Then it also separates from the satellite. 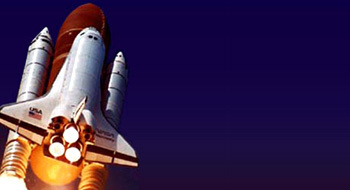 Another way people launch satellites is by having astronauts launch them from the U.S. space shuttle. They carry the satellites in the cargo bay. 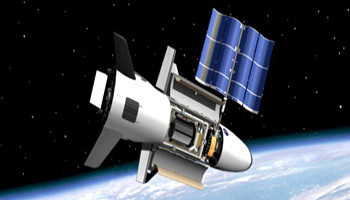 The shuttle can also bring satellites back to Earth for any repairs needed. Parts of Satellite Satellites have a great deal of equipment packed inside them. Most satellites have seven subsystems, and each one has special work to do. There are many kinds of satellites and many ways of building a satellite. Most satellites have similar parts, however. These parts include (1) radios to talk to people on earth; (2) rockets to move the satellite in space; (3) batteries to supply energy; and (4) computers to control the satellite. Some satellites also have cameras to take pictures from space. Satellites come in many shapes and sizes. But most have at least two parts in common – an antenna and a power source. The antenna sends and receives information, often to and from Earth. The power source can be a solar panel or battery. Solar panels make power by turning sunlight into electricity. Polar and Geostationary Satellites A geostationary satellite is an earth-orbiting satellite, placed at an altitude of approximately 35,800 kilometers (22,300 miles) directly over the equator, that revolves in the same direction the earth rotates (west to east). A polar orbit is one in which a satellite passes above or nearly above both poles of the body being orbited (usually Earth) on each revolution. Satellites orbit Earth at different heights, different speeds and along different paths. 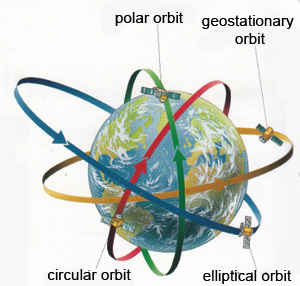 The two most common types of orbit are “geostationary” and “polar”. A geostationary satellite travels from west to east over the equator. It moves in the same direction and at the same rate Earth is spinning. A geostationary satellite circles the Earth once every 24 hours, the same amount of time it takes for the Earth to spin on its axis. From Earth, a geostationary satellite looks like it is standing still since it is always above the same location. That is why when we turn our home satellite dish to receive the TV signal from a particular geostationary satellite, we don&apos;t have to keep jumping up to adjust its position. Geostationary satellites can be positioned right over the areas where they are needed. They can also be used as spy satellites, because they remain constantly over a region of interest. Polar&dash;orbiting satellites travel in a north&dash;south direction from pole to pole. As Earth spins underneath, these satellites can scan the entire globe, one strip at a time. 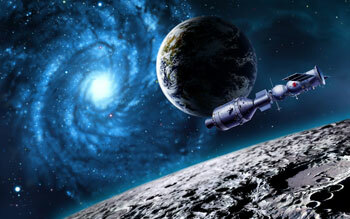 A polar orbit may be several hundred miles to several thousand miles above Earth. A satellite in a relatively low orbit circles the Earth approximately 14 times each day, while higher–orbiting satellites orbit less frequently. 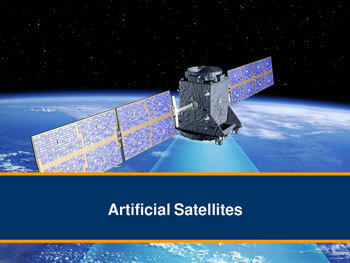 Artificial satellites are human-built objects orbiting the Earth and other planets in the Solar System. Artificial satellites are used to study the Earth, other planets, to help us communicate, and even to observe the distant Universe. There are six different types of artificial satellites: communication, resource, scientific, navigation and military. Satellites play a major part in today&apos;s communication. Radio, television and tele-weatherphone communications are bounced off satellites to cover the greatest possible area of the world. A technique called frequency reuse allows satellites to communicate with a number of ground stations using the same frequency by transmitting in narrow beams pointed toward each of the stations. Beam widths can be adjusted to cover areas as large as the entire country or as small as a state in that country. Two stations far enough apart can receive different messages transmitted on the same frequency. Satellite antennas have been designed to transmit several beams in different directions, using the same reflector. Bird's eye view of earth using GPS GPS satellites circle the earth twice a day in a very precise orbit and transmit signal information to earth. GPS receivers take this information and use triangulation to calculate the user's exact location. Some satellites take pictures of the planet that help meteorologists predict weather and track hurricanes. Some take pictures of other planets, the sun, black holes, dark matter or faraway galaxies. These pictures help scientists better understand the solar system and universe. 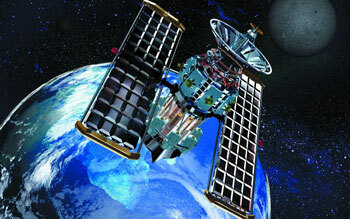 A group of more than 20 satellites make up the Global Positioning System, or GPS. If you have a GPS receiver, these satellites can help figure out your exact location. 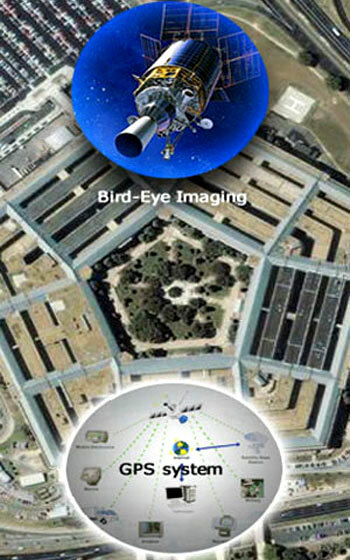 Military Satellites help the armed forces to navigate, communicate, and spy on other countries. They take pictures and pick up the radio waves that are sent by other countries. Some newspapers and magazines are more timely because they transmit their text and images to multiple printing sites via satellite to speed local distribution. Before sending signals down the wire into our houses, cable television depends on satellites to distribute its transmissions. We can reach proper destination using the satellite-based Global Positioning System (GPS). The goods we buy often reach distributors and retailers more efficiently and safely because trucking firms track the progress of their vehicles with the same GPS. Sometimes firms will even tell their drivers that they are driving too fast. Emergency radio beacons from downed aircraft and distressed ships may reach search-and-rescue teams when satellites relay the signal. Positioning of a Satellite Satellite that is to orbit the Earth is positioned at least 100 miles above the Earth's surface so that the atmospheric drag will not slow the satellite down. There are many different factors that contribute to the functioning of a satellite. For example: Orbital positions, gravitational forces, and disturbances in the atmosphere, etc. Scientists, while creating the satellites must account for these factors, so that they can solve any problems quickly and accurately. Some of problems that scientists might face can be – a change in the position of the satellite, (or) its failure to operate, etc. However, once the scientists are able to understand the causes of the problems, they can try to solve so as to make the satellite function accurately. Orbiting Satellite Also important in the orbit of a satellite is the adjusting of it while in orbit. This is done through the use of rockets. Throughout the life of the satellite the orbit and attitude, the direction it points, must be adjusted. 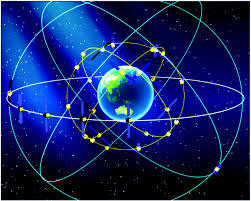 The orbit positions and conditions which are imposed on the satellite can help in determining its effectiveness. If the orbit is of less height from the Earth&apos;s surface, then the resistance of the outer atmosphere will cause the satellite to lose its orbital speed enter the Earth&apos;s atmosphere. More the height of the satellite the earth the orbit,longer will be the lifetime of the satellite. Suppose if the height of the Satellite is too high, then it can be disturbed by the attraction of the sun and the moon. Scientists need to consider the ellipse of the orbit in which the satellite needs to be placed because the effectiveness of the satellite depends on the ellipse of the satellite&apos;s orbit. 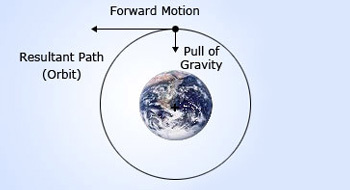 Forces Effecting Satellites Without gravity, the satellite's inertia would carry it off into space. Even with gravity, if the intended satellite goes too fast, it will eventually fly away. On the other hand, if the satellite goes too slowly, gravity will pull it back to Earth. We know that the Gravity is the force of attraction on an object by the Earth. It is the factor that gives weight to the object. The more is the distance of the object from the Earth, the less will be the gravitational force of attraction acting on it towards the Earth. The constant pull of many forces determine the movement and launch of satellites. The centripetal and centrifugal forces are the major ones that effect the satellites. The centripetal force is the one which causes an object to move in a circular path, which is always directed towards the center of the circle. The centrifugal force acts is the one which is proportional to the mass of the object and it is in a direction away from the center. There are many variables like orbits, forces and possible radioactive contamination to be considered while creating an artificial satellite. These factors contribute to the launching and life span of the satellites. These Satellites are very complicated structures, but their discoveries can be very helpful to all. Command center of a space station Space station control is an entity that manages aerospace vehicle flights, usually from the point of lift-off until the landing or the end of the mission. Getting the satellite in to the desired position is the next objective after launching a satellite. There are different position placement strategies that are used to keep the satellite in the desired orbit. 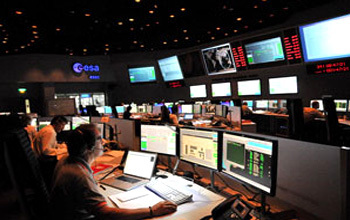 The command center plays a major role in sending the signals to the satellite to accomplish this task. The signals are received by the on board rockets which move the satellite in to the desired position. Geosynchronous orbit (orbit which is in time with the Earth&apos;s rotation) is the one in which the satellite has to be positioned using the signals sent form the command center. 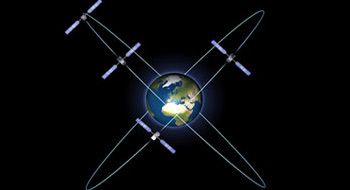 Final geosynchronous orbital slot Communications satellites and weather satellites are often given geostationary orbits, so that the satellite antennas that communicate with them do not have to move to track them, but can be pointed permanently at the position in the sky where they stay. There are three stages to keep a satellite in a particular orbit. The first stage raises the satellite to an elevation of about 50 miles from the Earth. The second stage raises the satellite 100 miles from the Earth and the third stage places it into the transfer orbit. As we know that the satellite is placed in its final geosynchronous orbital slot by a rocket which is used to move the satellite. An object in geosynchronous orbit has an orbital period equal to the Earth's rotational period (one sidereal day), and thus appears motionless, at a fixed position in the sky, to ground observers. Timely Positioning of Satellite Rockets are used to make small adjustments in the speed of satellites. It is important to adjust the position of a satellite while moving in an orbit. This is done by using rockets. Throughout the life of the satellite the orbit and altitude, the direction it points, must be adjusted. Generally they have on&dash;board rockets for this purpose. Sometimes the rocket may be fired to accelerate the satellite and move it to a higher orbit or to decelerate the satellite and move it to a lower orbit. It can also be changed by firing the rocket to the side which changes the direction the satellite points. With the use of these special rockets the satellite can be moved to any desired position at any time. Consider an example of a satellite located at 22,300 miles above the Earth&apos;s surface which is said to be synchronous, i.e., it takes exactly 24 hours to orbit the Earth completely. Not all orbits are said to be synchronous and moreover the time required for a satellite to complete one revolution around the Earth depends on its altitude. The laws that govern a satellite in orbit are the same laws that govern the motion of natural satellites and it travels around the planet in a nearly circular orbit when it reaches the 100 mile mark above the Earth&apos;s surface.